Randy Seaver is at it again! He’s got his Saturday Night Genealogy Fun challenge posted for this week. This week the challenge is to see how far back I can go with my ancestry with tombstones. This must be a continuous line. This may be a very short post. First, most of my ancestors were relatively new immigrants. My “oldest” line came over in the late 1840s. Second, my maternal grandma was cremated and there is no tombstone. That sort of crosses her line off the list right off the bat. My Dad was cremated also. No tombstone for him either. So, it looks like I’m working with the Azoreans again. The first tombstone is that of my grandfather, Joao “Bohne” Pacheco Smith. I know. His name is not on the tombstone. The name on the stone is that of his brother who died in 1913 of influenza. My grandfather was added to this plot when he died in 1957, but his name wasn’t added to the stone. Also, in this plot is Theodore Souza, my great aunt’s son who died young. This is why it’s a good reason to check the cemetery files if you can gain access to them. This was the entry in the log book at St. Mary’s Cemetery in Oakland, CA. If I hadn’t asked to see these books, I probably would not have know that my grandfather and has nephew were buried in this plot, too. 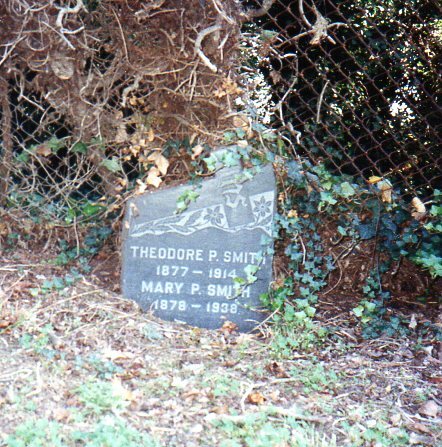 The next ancestor tombstone is my great grandparents, Theodoro Pacheco and Maria de Braga (aka Theodore and Mary P. Smith). They are buried at St. Mary’s Cemetery as well and are also noted on the log sheet above. There is also someone else buried in their plot who is not listed on the stone. It is their nephew, William Pacheco Algrava, who died young. He was the son of Theodoro’s brother, Manoel. Sadly, I think that when I went to visit this plot I may have been the first person there since the 1950s. As you can see, the vines from the fence were overgrown and reaching out to the tombstone. I cleaned up the area as best I could before I left. 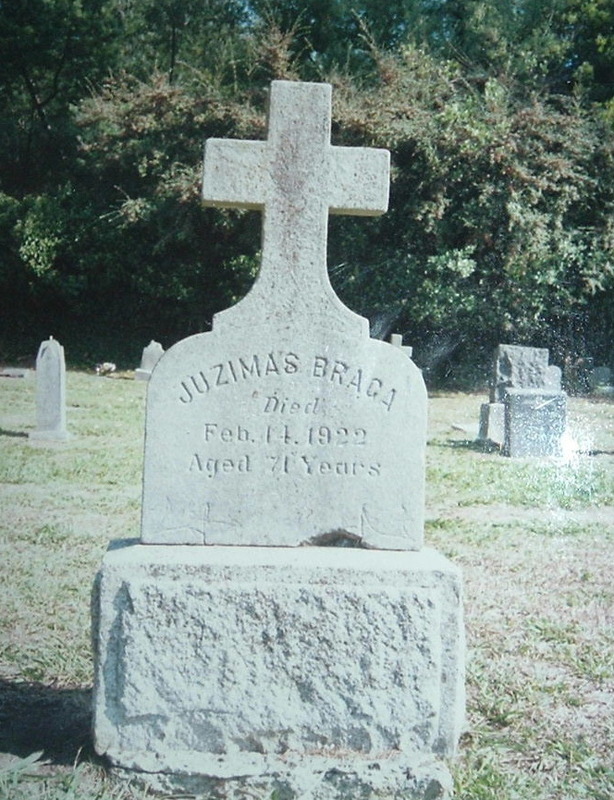 The last tombstone of the de Braga line that I have is that of my great great grandfather, Jozimas de Braga. He was buried at St. Mary’s, too. 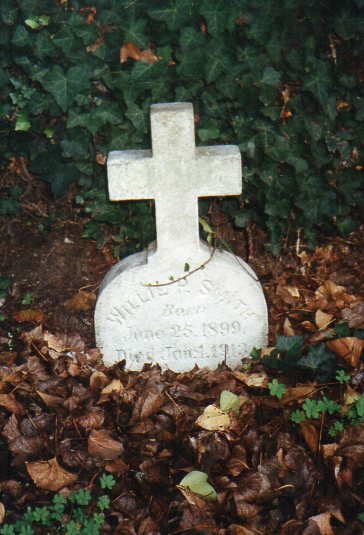 Again, another relative is buried in the plot but not listed on the stone. It is Jozimas’ granddaughter, Sophie (Bonita) Guido, who died at the age of 25 of cancer. 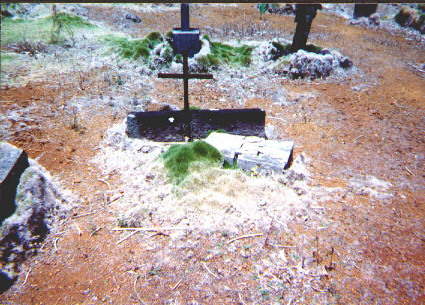 Jozimas’ wife is buried somewhere on Kauai. I have not located her burial as yet. The last of the Pacheco tombstones is that of my great great grandmother, Ana Jacinta de Mello Pacheco. Ana is buried at St. Sylvester’s Cemetery (aka Kilauea Catholic Cemetery), Kilauea, Kauai, HI. Her stone was in bad state when a friend took this photo for me. Ana was born ca 1830 in Achada, Nordeste, Sao Miguel Island, Azores. She died in 4 Dec 1902, most likely in Kilauea. So, I can go three generations with tombstones on the Pacheco de Braga lines. I don’t think it is possible to go any further with my Azorean roots. As I understand it the burial practices are different than the US and they are temporary because of the lack of space on the islands. I was once told that it was common to give islanders a burial at sea because of the lack of land. Maybe one of my readers can provide more information on the burial practices. Thanks for this interesting challenge, Randy! I’m looking forward to next week.